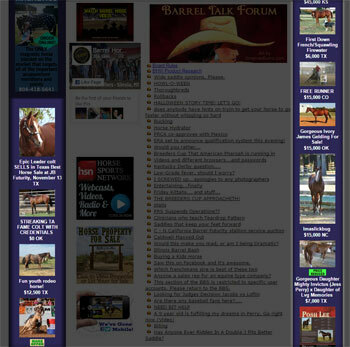 Promote your horse or stallion service front and center across our network of sites. If do not yet have a horse or stallion listing, look for the option to feature your listing during checkout. You can also upgrade your ad at any time -- for a whole month or for just a couple days. Need a little extra bump or want to sell quick? Featured listings will help with that! Your listing is placed directly on our homepage giving you maximum exposure. Our system tracks the number of times your ad is displayed on the homepage. 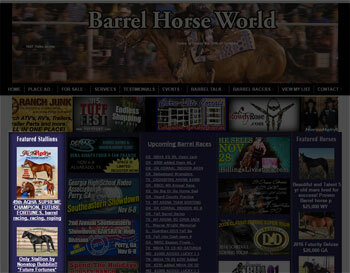 Barrel Horse World receives millions of visitors every month! Your stallion service listing is presented near the very top of our homepage! 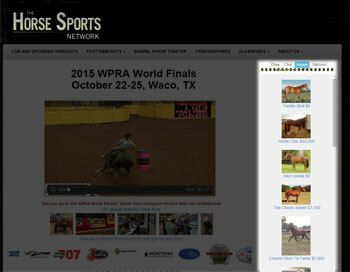 You can also choose to feature your horse or stallion on Horse Sports Network. The Horse Sports Network regularly recieves turnouts of many thousands of viewers for our live and on-demand webcasts. Your listing is featured prominently in the sidebar, right next to the video. Note: We make an effort to display every featured ad on every page load, but during periods of very high activity, that may not be possible. In these circumstances, your ad will be roatated in and out randomly along with everyone else's. Refreshing the page a few times should cause it to display.